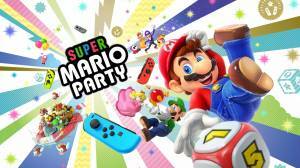 Super Mario Party is the eleventh main instalment in the Mario Party series and is exclusively available only on the Nintendo Switch video game console. The original board game style that Super Mario is famous for returns with deeper strategic elements that includes specifc Dice Blocks for each character as they take turns racing across the board searching for Stars. The game also has a variety of new modes and rougly 80 minigames which can either be played using traditional button controls or by motion controls. Players can also see how they stack up against players across the globe in Online Mariothon. No discussions open for Super Mario Party at the moment.